In many states such as California, solar systems are exempt from property tax assessments. However, the value of the solar system can still be added to the appraised value of the property. Businesses investing in solar technologies can receive a 30% federal tax credit on the gross installed solar thermal system cost through the Business Energy Investment Tax Credit (ITC). Under the federal Modified Accelerated Cost-Recovery System (MACRS), solar thermal system investments can benefit through depreciation deductions over a five year period. Whether you’re a hotel, a restaurant, hospital, laundromat, or apartment complex, your clients will respect your commitment to clean, renewable energy sources. Installing solar hot water is not only cost effective, but also a way to attract green-minded customers and set your business apart from your competition. 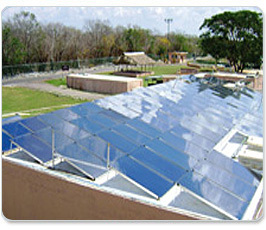 For a free evaluation for your commercial solar thermal application, contact us.